Leigh Copp is the Chief Engineer for the Advanced Systems Group at Linamar, a leading designer and manufacturer of machined components for today’s sophisticated vehicle transmission and driveline systems and mobile industrial products. As the Chief Engineer and Business Unit Manager for the Advanced Systems Group, he and his team are called on to troubleshoot a variety of systems, including an induction heating system designed to heat treat metal parts for maximum strength and durability. Although reliable, the induction heating system does need troubleshooting from time to time. The first step he takes is determining whether the problem is with the machine control or the power supply. 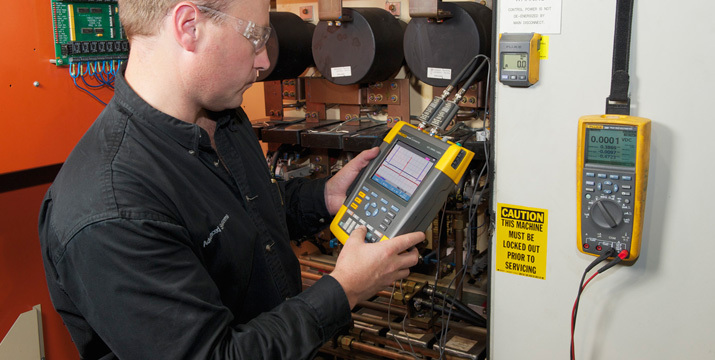 To do this, he uses a variety of tools including the Fluke 771 Milliamp Process Clamp Meter to verify 4 to 20 mA loops, the Fluke 381 Clamp Meter to measure line current, and even the Fluke 190-204 ScopeMeter® handheld oscilloscope to check gate pulses. Download this free application note to read more about his experience.